You can also do what you want, eat where you want, have your own timetable, etc. I’m never not single, so I don’t know what the other side of the coin is! This is a wonderful self-validating post. It’s so important to have a healthy sense of self before committing to someone else. I’ve been single for a year, and I really appreciate the freedom and independence to live on my own terms after being committed for a long time! I can’t see myself entering another for a while because I’m too focused on my own goals! You’re right it’s bad to leap from one relationship to another, I feel it undermines relationships and love and stops people from truly appreciating something special when it comes along! Since I have been single, I have settled in one place, purchased a house, made new friends, grown as a professional and a writer/editor, and created new adventures. It has been a positive time, teaching me that I am great on my own. Still, the right relationship would enhance all of that and give birth to something more. 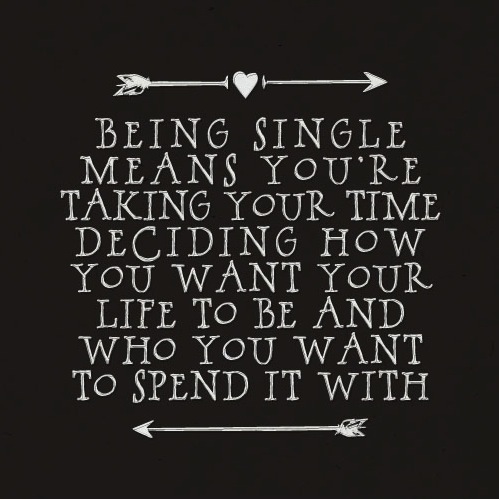 I love being single, but I hate the stigma and questions that go with it!